This not a hoax, people! Not a dream! You have just witnessed Hate Frog's ultimate defeat! The final round of the fight that began here. It seems like it was only yesterday we first saw Hate Frog . . . Remember when he first threatened our heroes, or fought Drip-Drop Man? If you look back at that fight, you'll see Drip-Drop Man's critical error . . . he was actually winning, but he kept on taunting Hate Frog. Hate Frog is powered by rage, so making him angry is the worst thing you could do. Dumb move, DDM! 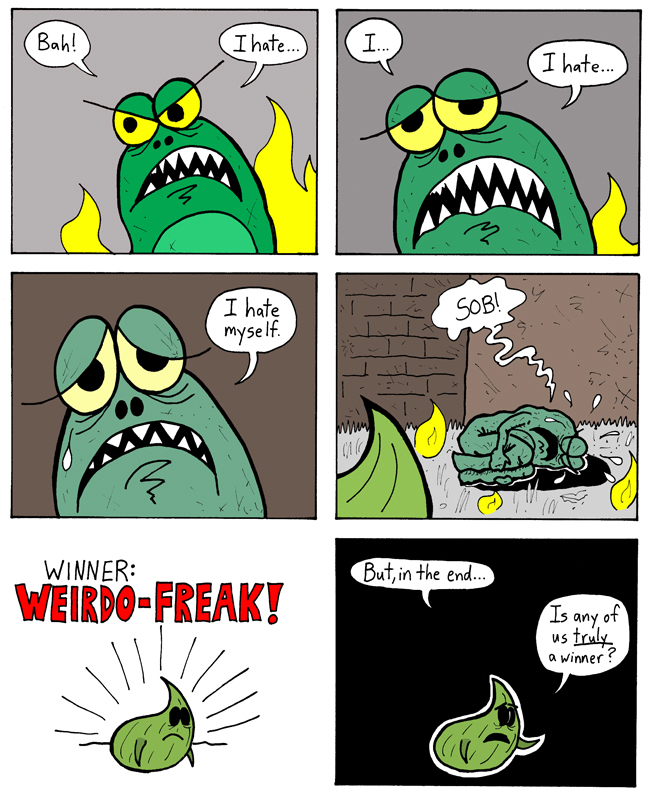 Weirdo-Freak was smart enough to take a different approach, and to realize that Hate Frog was too worn out to resist succumbing to despair. Anyway, for some time now I've been updating on Thursdays, but my new web comic The Electric Team is updating on Thursdays now, so let's try out Wednesday and see how that goes. NEXT WEEK: Hate Frog is defeated, but the battle rages on! And what is Fuzzball and Scuzzball's secret plan, anyway?